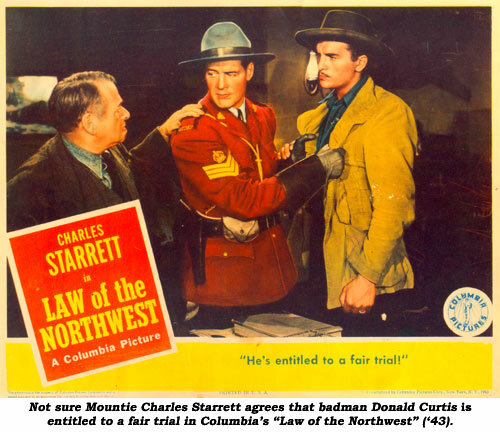 Too often overlooked as a heavy in ‘40s Columbia B-westerns, Donald Curtis went from badman to ordained minister. Born Curtis Donald Rudolf February 27, 1915, in Cheney, WA (near Eugene), Curtis won a scholarship then obtained a B.S. and M.A. in dramatic production from the School of Speech at Northwestern University in Evanston, IL. He worked as an associate professor of dramatic Art at Duquesne University in Pittsburgh, PA, then won a Rockefeller Fellowship and used it to study acting. 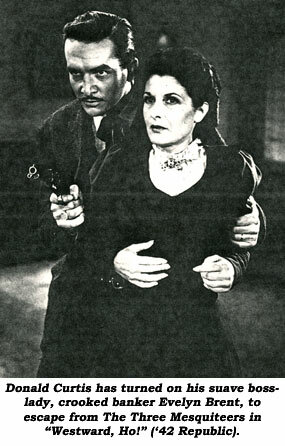 His stage experience includes a role on Broadway in ‘49’s “Goodbye My Fancy”. West Coast productions of “Life with Father”, “Outward Bound”, “The Male Animal” and numerous others also fill his resume. 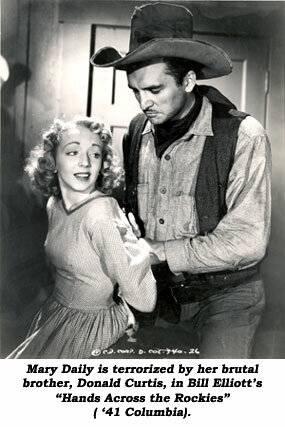 After making his screen debut uncredited as an ambulance intern in “Emergency Squad” (‘40 Paramount), which starred Bill Henry, Curtis’ next role as Ronal, one of Prince Barin’s trusted officers, in Universal’s third (and final) Flash Gordon serial, “Flash Gordon Conquers the Universe” (‘40), established him further. A small role as a thug in another Universal serial, “Junior G-Men”, followed the same year. 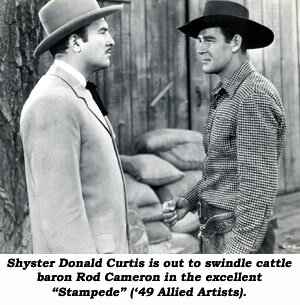 Roles in a dozen B-westerns in the ‘40s opposite Tex Ritter, Bill Elliott, Charles Starrett, Russell Hayden and the 3 Mesquiteers, led to a contract at prestigious MGM from ‘43-‘46. For well over 20 years Curtis and his wife, Dorothy, lived in Dallas, TX, where they were known not for his film career, but as Reverend Donald Curtis and Reverend Dorothy Curtis, pastors of Unity Church on Forest Lane. He established and recorded the five-times-per-week program, “Five Minutes That Will Change Your Life” on WRR radio. The program was also in syndication. Curtis was the author of 30 books on self improvement, metaphysics and New Thought. He traveled throughout the world giving classes and seminars on meditation and higher dimensions of human potential. He appeared on “Oprah Winfrey” in ‘87 discussing true meaning of the new age. 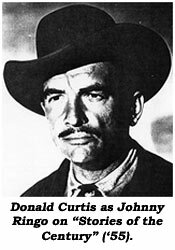 Curtis was honored at the Memphis Film Festival in ‘89 and a few years later retired to Desert Hot Springs, CA, where, at 82, he died on May 22, 1997, of unknown causes.